Some of you may know from reading my articles that before I became a writer, I was a professional ballet dancer. In fact, my love of dance is one of the reasons I adore Bollywood films so much. When I heard that a dancer from one of my all time favorite shows, So You Think You Can Dance (SYTYCD), was going to be in a Bollywood film, I was extremely excited. 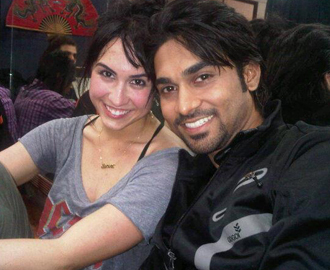 That dancer is the fabulous Lauren Gottlieb. She was a contestant on Season 3 of the US reality dance show and all of you true SYTYCD devotees will also have noticed her working on the show as a choreographer’s assistant. We have also been treated to watching her as one of the All-Star Dancers on the last three seasons. This amazing dancer has also worked and performed with musical stars like Rihanna, Mariah Cary, Britney Spears, Shakira, and Carrey Underwood, to name a few. Lauren says that she always knew that she wanted to be a dancer in the movies, but where that would take her she could never have guessed. Lauren is playing one of the leads in ABCD (Any Body Can Dance), India’s first 3D dance film directed by the great Remo D’Souza and starring one of the best dancers in the world, Prabhu Deva. Of course, as soon as I found out she was going to be in ABCD, I was determined to talk to her about it and I was lucky to get the chance to do just that! We had a fun and fantastic conversation talking all things ABCD. Enjoy! I know I did! How did the role in ABCD come about? It was so crazy and so awesome. I actually got an email from UTV Motion Pictures saying Remo D’Souza, one of the biggest choreographers in India and now a director, was a huge fan of mine when I was on SYTYCD Season 3 and he wanted me to be a part of his film. It came through as an email on my website. You know, I didn’t go to bed that whole night and I got my parents up in the morning and I was like, ‘Hey! I am going to India’. So crazy. No audition process at all. It was just fate. Getting that email must have been amazing and then getting the opportunity to come to India must have been so incredible. Something I never thought was going to happen in my life. It was just one of those weird things that comes up and I just knew it in my heart that I was supposed to go and be a part of this. I didn’t really know what to expect. I relied a lot on fate and just hoping it turned out right. I jumped into a new country across the other side of the world, a new language, a new culture, and everything. When I walked on set and I saw this big huge production, I was like, ‘Whoa, this is big’! I knew from a really young age that this is what I wanted to do. One of the only things I was certain about in my life was that I was supposed to move to Los Angeles and be a dancer. I would watch Center Stage and I would watch some of the dance movies and be like, ‘That is going to be me!’ I would say in a very confident way, ‘I am going to be “that girl” one day.’ I had no idea it was going to be “that girl” in Bollywood. How much did you know about Bollywood before you became part of the project? The only thing I knew was what we had been taught for the past couple years on SYTYCD. That was a nice introduction. I really didn’t know much about the movies. So tell us about your role, who is she? I play Rhea and she is one of the lead girls. 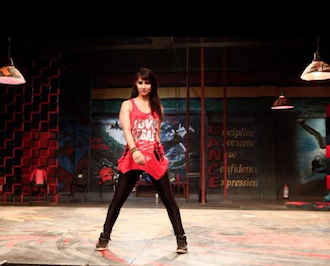 She actually starts in the technical school of dance run by KK Menon’s character. She is a very technical, contemporary, ballet dancer. A fight happens at the school between KK Menon’s character and Vishnu, played by Prabhu Deva. Vishnu decides to break away, and I end up asking to be a part of his new adventure that he goes on with these kids. 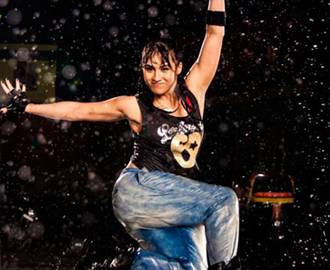 So you see, Rhea goes from being a technical, classical dancer into doing hip-hop for the first time. It was extremely overwhelming, it really was. It was one of my first times being in another country. I have visited London before but for the most part I tour around the United States and Canada. This was a completely different world. This was one of the most challenging things I think I could ever do. I am always about stepping out of my comfort zone – I think that when you get into your comfort zone you just make everything such a routine and your passion dies down a little bit. I have been fortunate enough to do some projects that were just SO far out of my comfort zone. Like SYTYCD was one: I had danced a certain way my whole life and then in 5 and 1/2 hours we needed to put together a routine. That is something we have never done before in front of the world! There are certain things where I really had to jump out of my own skin, and this movie was one of them. It was my first leading role and I was ready – I WAS SO READY! But I didn’t have too much time to settle in before I went right into my language classes with a Hindi coach. We had to figure out what the best, quickest, and most efficient way to learn this language would be, because I only had a week and a few days. I would look at the word and would want to pronounce it phonetically like we would in English, but it was just a completely different alphabet. I was like, ‘How is this possible?’ I kind of started to realize that if I looked at the words written the way I would pronounce them that would be the quickest way, instead of really breaking down the alphabet. It’s a different way of speaking as well, like for some of the words, like a TH, your tongue goes between your teeth. It was just so different. So above each word in my script you will see it spelled out phonetically how we would say it in English. When I actually would go through and study it, I would be studying the way I would sound it out and not the way it would be spelled because it was just impossible in that time. Then, there was also the fact that when the rehearsal is up I was not rehearsing my lines just to make sure that I have my script down. I am actually looking around at everyone else’s faces, because I was understanding what I was speaking, but when you are listening to someone else speak their lines it was too fast and it was too much to really understand all of it word for word. All those human qualities of when you nod and when you are listening to someone speaking and you realize something through dialogue – I didn’t know the timing of that in their culture and language. So when rehearsal was up, I would have to look around and kind of gauge timing of when people were reacting. I am now studying Hindi; it is something I want to learn fully, especially if other opportunities come from Bollywood. I hadn’t thought of that, the responses and reactions you would have to make even if you didn’t completely know what they were saying. Yeah! It was insane. It was just the most challenging thing, and that is why I feel I could do anything! Nothing is ever going to be like that. I could be on any set doing anything and I’ll survive. What was it like to work with Prabhu Deva? I mean, he is such an incredible dancer. I had heard of him while I was going out there, but you don’t really know until you get out there and you see. He is a legend in his own right. Being in front of him I could feel that. I could feel that presence that he carried. It felt really special to be in scenes with him. We would be off on the side and he would want to be teaching me a little something and then he was like, ‘Teach me, teach me. I want to see how you dance.’ It was just really fun! What about with Salman Yusuff Khan, how was it to work with him? What about working with director Remo D’Souza? There is this calm, cool swagger about him. There were a lot of players in this game. There were a lot of things that had to be done and in a timely fashion. To have the director be so calm and comforting and helpful to me especially since I was in their country for the first time it was just such a blessing. You know, he is not only a director, but he was a dancer and a choreographer and he understood fully what I was going through. It was so great! I have loved the dance sequences I have seen in the promos so far and there are so many styles that the choreography encompasses. Can you tell me what we can expect to see in the film? Again, I didn’t have any idea what to expect when I went out there. I was jumping into a Bollywood film and I was thinking, yeah, I am going to get to learn classical Bollywood dancing. It was mostly stuff I was familiar with because they wanted it to be more of a westernized Bollywood film to try to push the boundaries for India. Without giving away the script, there are a couple of Bollywood dances that we do, so I did get to learn some of the classical dancing like Kathak. But you will see hip-hop, you see krumping, you see breaking, you see contemporary, ballet, pointe, and then as I said, the Indian dances, so you see everything. I think it is going to be so enjoyable for the audience to watch. First thought when you saw the trailer? Oh My God! I knew what I had been seeing when I was there and I kept calling my friends and my family and my team behind me and I kept going, ‘Guys, this is going to be huge!’ I don’t think anyone fully knew until they saw it. Since the time zone is a 12 and a half hour difference I woke up one morning and my phone was blowing up. I had, like, over a 1000 messages and I had no idea what had happened. All of a sudden I look online and the trailer is on. I was by myself at the time and I just couldn’t be by myself, so I got up and went over to my best friends’ place and woke them up. It was 7 in the morning. (Laughs) They were so thrown off and confused because I am standing in their doorway and I was saying you have to watch this. I traveled around Los Angeles that day showing my friends, my family, my team, and everyone’s jaws were on the floor. They didn’t expect that. I was like, I told you! The excitement from the first look and the songs has been huge! How does that feel? It blows my mind. I knew going out there who was a part of this – UTV Motion Pictures is no joke; it is a huge production company. I knew what I was experiencing while making it so I was kind of expecting what it would be, but when you see that trailer… it is so bright, it is so colorful! You know, I have been peeking in at the forums even though I was taught on SYTYCD not to read the forums and read what people said (Laughs), but I have always been really connected to my fans! I want to hear how everyone is appreciating it. I think a couple of people right from the jump were comparing it to a Step Up movie, which is going to happen. But I think looking at trailer, there is going to be something so special about it. You see the Indian heritage and heart in it, and I think that is something that our Step Up movies have been lacking in their scripts. I think that is going to draw this raw factor to it, and it is going to be unlike anything else. It is just going to be out of this world. Who do you admire as dancers in Bollywood? Hrithik Roshan is one of my favorites. I could watch his dancing all day. Before working with Prabhu Deva, I wanted to do some research before dancing in front of him, and my research turned into months of searching his videos. He is just out of the world. I had people in my own crew to study and learn from. All the dancers in the film were all on Dance India Dance; it’s kind of like a SYTYCD. I so respect what they do over there because they do something we don’t and they take a lot of risks. They do a lot of stunt work and a lot of silks. I look at them and I could never do that. It was funny because while we were in rehearsal they would want to see a video of my SYTYCD performance and then I would be like okay show me yours. We would just go back and forth and show each other our stuff. To be with dancers and different dances for three months – it was the most enjoyable experience of my life. The music for ABCD is definitely one of a kind! Jigar, Sachin, and Mayar Puri created what I think is the perfect soundtrack for the film. I’m constantly dancing around my apartment to all of the exciting tracks! What did you bring back with you from your experience of working on ABCD? I think it gave me back that passion. Not that I had really lost it over the years, but I grew up my entire life dancing. I have danced in jazz, contemporary, and hip-hop my entire life. Doing SYTYCD was probably one of the best things you could ever do as a dancer because we weren’t in the background, we were in the foreground, and our name was in lights. That was great, and we went on tour. And through SYTYCD and other jobs I opened up to do more ballroom and cheerleading stuff. Then, after awhile, you start doing jobs, and I switched into acting and into hosting. But still a little bit of the passion can die down for a little bit when you are focusing on it being a job. Anything that is labeled a job kind of dips down that passion. But Bollywood is so completely different. It just brought back this heart to my dancing. I feel like there is a piece of my heart that is still in India and I think it is because it just brought that back to me. They have dance and music inside their culture and out, and you just feel it all around India. That heart and soul that Bollywood dancing has, it brought it back to me. It has changed me so completely. It’s kind of all I want to do right now. And everyone keeps laughing. I teach master classes all the time and I am like, can I teach some Bollywood? They are a little unsure, but by the end of the class I have everyone screaming and cheering while they are dancing, then coming up and saying it is the best thing they have ever done and they want to find more Bollywood classes. It is now starting to be this big thing out here. If I can bring a little bit of that fun and culture to the United States I am going to do it. I am obsessed with it. Yeah right?!? How could you not? (Laughs) I think more and more, especially through great shows like SYTYCD, it is bringing Bollywood more on the table and into people’s households. I don’t know exactly how the US is going to take this film, but the storyline is so great. If anyone is comparing it to anything we have done over here, dance film wise, I think they are going to be really shocked when they see it. The story line is really interesting and there are a lot of key players in it. When you think one person is the main character, the next second there is another story line that develops and it is really interesting. That super smiley dancing is so much fun that if I could go ever to Bollywood and do more and more films over there and kind of have that character, Oh God, it would just be the most exciting thing. That was my next question, whether you would want to do another Bollywood movie, but I assume that answer is yes! I would be back there in a heartbeat. I am like itching for it. I had a great run in ABCD and it was just an introduction. I almost don’t feel like it was an accident that I ended up over there. I always view my life like everything happens for a reason. I have had great opportunities in life and I have also had some great setbacks, but those setbacks have made me stronger and plus made me realize it wasn’t something I was supposed to do at that time. I don’t think it was an accident that I was brought out to India to do this film and how much I fell in love with it all. It is a different language, it is a different dance style and a different culture, but it is something I would love to dive more into and understand more and be a part of it. If there was another opportunity that came up I would be really excited to hear about it. I would like to thank Lauren for taking time out of her busy schedule and having such a fabulous talk. If you can’t tell, I had a wonderful time talking with Lauren about 3 things I love: dance, SYTYCD, and Bollywood! Forgive me as I take off my professional writer/editor hat and say as a former ballet dancer, from a huge Bollywood fan and SYTYCD fan: “You go, girl! I can’t wait to see you kill it in this film”. Okay now I have that off my chest, I can simply say you can see Lauren and the rest of the killer dancers and their moves when ABCD opens on February 8th! 15 queries in 0.549 seconds.